“This is a special college that gives you the opportunity to choose programmes that you will never go round looking for jobs. 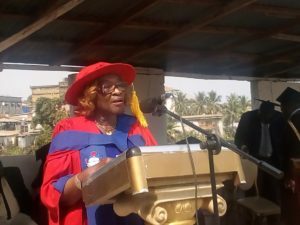 As you are here, I beg of you to open your heart, listen to your lectures and do not want to have it the short way but get yourself involved in what you have come to study so that at the end, you will have no reason to regret,” she urged. “Make the best use of this opportunity and be sure of giving back to the institution and the nation as a whole. In this institution you have find yourself, we don’t just give out degrees but we also look at your character,” she said. “You are welcoming today in this great place. Today you are formally initiated into this college. You have chosen to come to the right institution because we are post-modern tertiary institution. We are head of technology by a mile,” he said.